This is one of the most powerful portraits I’ve ever made and it happened in less than a minute. Rashid is a driver in my wife’s hometown of Hazaribagh in Jharkhand India. Rashid has taught three generations of my wife’s family how to drive and he’s still driving for the family after all these years. My wife’s family is Hindu and Rashid is Muslim, but I would have never known Rashid is Muslim until I tried to touch his feet, a common Hindu sign of respect for elders. But Muslims don’t touch feet, they hug, so Rashid stopped me and gave me a big hug instead. All of this came after the previous night when I gifted Rashid an 8x12” print of this portrait that I made a few days before. I knew I wanted to make a portrait of Rashid the moment I saw him again (we met on my two previous trips as well). 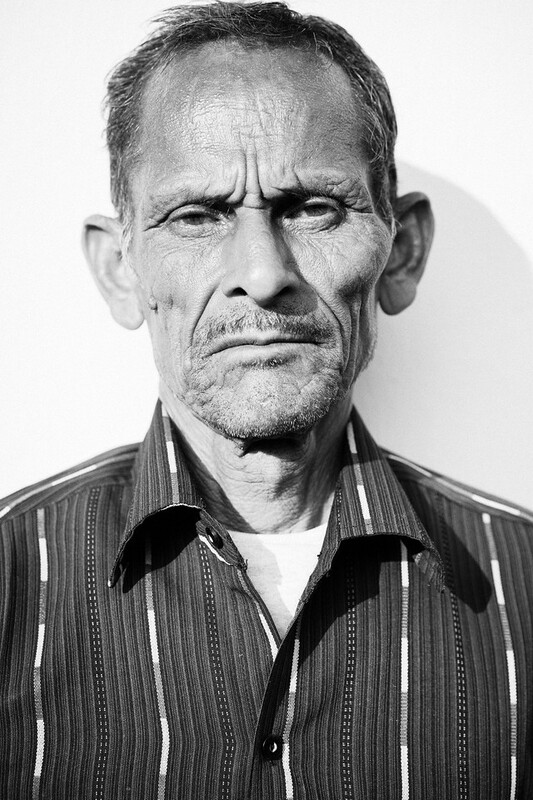 But the laziness of Hazaribagh set in on me and I almost didn’t make his portrait at all. I was lazing around the front porch reading magazines and drinking tea, as I did most days in Hazaribagh, and like most days, Rashid was there to drive us anywhere we’d like to go. He was excited about driving us, but we were more interested in soaking up the sun on the front porch. Each day after he’d do everything he possibly could to keep from being bored crazy, he’d find me and point to the car and signal with his thumbs “let’s go.” Most of the time we had nowhere to go and everyone was content to sit in the sun and drink tea instead. But one of those times I said I’d rather make his portrait instead and signaled for Rashid to pose for me in front of a white wall in the direct sunlight. He went along, gave me his standing blank facial expression and we made this photo in less than a minute. That was it. A few days later I converted the photo to black and white and made the print for Rashid. He was very happy to have it, as I don’t think he ever expected to see himself in that big of a print. He drove us all around Hazaribagh and Jharkhand and he was always happy on the road. Thank you Rashid, I really enjoyed rolling with you! My wife and I just returned from an amazing trip to India, with my parents and little sister joining us for the adventure. It was my third trip to India, so I thought I knew what I was in for, but there is really nothing that can prepare you for 17 days in India. India is so much different than the US! I don’t think it will ever become “normal” for me, and that’s a good thing. It helps that India is huge and on each trip we visit at least one new area. I will probably never have the pleasure of visiting every corner of the country, but I’ll try! I’m going to post a few more blogs about my experiences in India over the next couple of weeks, so stay tuned for more. Learn to see the light on your own. You do not need someone to show you a lighting diagram or detail their lighting technique if you can see the light on your own. So as usual, I’ll tell you how this photo was lit and how you can see the light for yourself. This photo is lit with direct sunlight and you can see that the sunlight was coming from behind me and camera left based on the shadow under Rashid’s nose, and behind his head on the wall. How would you know this is direct sunlight? Well you can’t be sure it’s sunlight, but you do know from the shadow under Rashid’s nose that it’s a small light source due to the hard edge (clearly defined shadow line) and the sun is the most popular hard light source we have around, so it’s a good guess. Lastly, you can see some reflected sunlight bouncing off of the wall highlighting the left edge of Rashid’s face. It would be very easy to replicate this lighting in the studio with a single bare strobe on a white wall, perhaps adding in a silver reflector on the shadow side of the face to create the edge highlight we see on Rashid. The most difficult part of this type of lighting is making sure you get the exposure right by using the spot meter in the camera. Working in the sunny outdoors with white walls around you can make it very hard to see the screen on your camera, so chimping the screen isn’t going to help you. Photographed with the Sony A7 and Zeiss 55mm f/1.8, at f/4, 1/125 of a second, ISO 50.